'Fat Thursday' is the first day of the Carnival cycle, when the King of Carnival (Carnestoltes) makes his triumphant entrance into Barcelona with 'l'Arribo' (The Arrival), the central event of the Barcelona Carnival festivities. 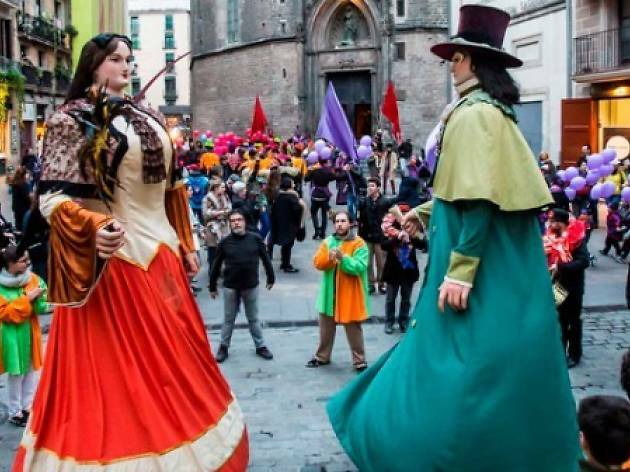 The big party involves the King and his Court: the Prime Minister, the Seven Ambassadors with their attachés, musicians, flag bearers, the Barcelona Carnival giants Rodanxó and Rodanxona and more revellers. The parade will be received in Plaça Sant Jaume, and at 5.45pm the party starts with Frank-i-fals, the King's prime minister, who gets things underway. 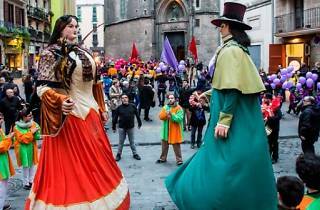 At 6pm the parade of the Seven Ambassadors sets off from the Palau de la Virreina, and they're accompanied by their entourage and the Carnival giants. They head along through various spaces in the Barri Gòtic until they get to Plaça Sant Jaume, where the King proclaims his reign over the week of abandon.